The air above Mauna Loa may have reached a critical new milestone when it comes to global warming, but that same air has propelled a mass movement to preserve the climate and the human life it sustains. Standing atop Mauna Loa in Hawaii, with this gorgeous view in front of me, it was hard to imagine that the air I was breathing carried a deadly message. Then again, as the largest volcano on Earth, Mauna Loa is not exactly home to the most welcoming of climates. Ancient Hawaiians only went there to make offerings. Tourists seldom visit. The only reason to drive away from the tropical beaches below, up a poorly maintained road that has potholes within potholes, through several climate zones each colder and less hospitable than the last, is to study, well, the climate. 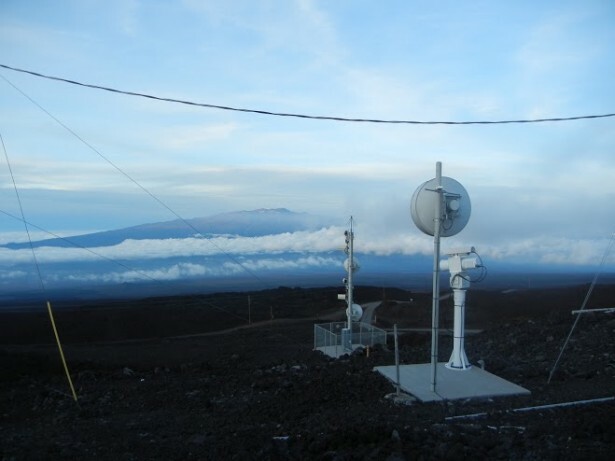 Since the 1950s, scientists at the Mauna Loa Observatory have been monitoring changes in the atmosphere — most prominently, the increasing concentration of carbon dioxide (the primary greenhouse gas emitted by humans). When I was there in January 2012, CO2 was measured at 397 parts per million. That’s nearly 120 ppm above pre-industrial levels, about 80 ppm above the first measurement in 1958 and 47 ppm above what’s considered the safe upper limit. Last week, for the first time in several million years, we reached the milestone figure of 400 ppm. As a result, this generally overlooked beacon of climate science, administered by the National Oceanic and Atmospheric Administration, found itself in the news. But in many ways, the news can frequently be traced back to this remote peak in the middle of the Pacific Ocean. From extreme weather to political debate to massive protests like the ones against the Keystone XL pipeline, the research from Mauna Loa is one of the main reasons we talk about climate change and understand that it is the result of humans altering the composition of the atmosphere. Of course, not all scientists can remain so neutral after so many years of waiting for society to do anything with their research. NASA climate scientist James Hansen recently announced his retirement to pursue activism full time. After being the first scientist to testify before Congress about the threat of climate change in 1988, then seeing two decades of inaction — not to mention his research being subverted by the Bush administration — Hansen has become increasingly more outspoken, and he has been arrested at several civil disobedience actions in recent years targeting the fossil fuel industry. The last two weeks of July are, statistically, the hottest stretch of the year. This year we want to make them politically hot too. Which means we need you, out on the front line. We need some of you to risk going to jail, and all of you to show up and speak out. Of course, it won’t just be the end of July when climate actions start heating up. In June, climate justice groups across the country are launching something called “Fearless Summer,” focused on mining and drilling sites. Meanwhile, indigenous groups organizing around land rights issues are calling for a “Sovereignty Summer” and student-led fossil fuel divestment campaigns will look to continue building momentum heading into the fall. 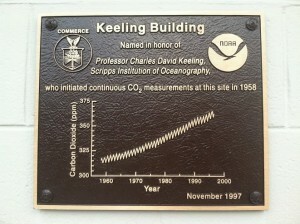 All this would likely be appreciated by Charles Keeling, the man who began the observations on Mauna Loa and first noticed the rise in CO2 concentrations. Although he was cautious to make pronouncements about his research, he became less so in his later years. In 1998, he published an essay rebutting claims that global warming was a myth, stating that the real myth was that “natural resources and the ability of the earth’s habitable regions to absorb the impacts of human activities are limitless.” But Keeling passed away in 2005, just as the political battle lines were beginning to harden — something his wife later told The New York Times would have dismayed him. If there is any antidote for such dismay, however, it has to be this burst of activism — a burst that has emanated from the top of a volcano in Hawaii, has reached the mainland, and is now poised to push for change that preserves and sustains human life. Maybe that’s the real message in the air above Mauna Loa. If that’s the case, it’s not so deadly after all. And now with the CO2 reaching 400 ppm, it will only be a matter of time what our species decides and what our planet will now respond to our stupidity.